This species is not often seen, spending most of its time skulking in the undergrowth, most records coming from the males’ ‘reeling’ song. Grasshopper Warblers were found in 83 tetrads in this survey, down from 114 in First Atlas. Their strongholds remain as they were twenty years ago: the north and west fringes of Wirral, the Chester area and the Mersey Valley. Although they can turn up anywhere, there are now fewer records away from their favoured areas. About half of the 42 new tetrads were adjoining their core areas, whilst most of the 72 ‘losses’ are scattered across the county. Notably, in the First Atlas there were ten tetrads with records around Sandbach - Congleton, where there were none in this survey. It was not surprising that only 10 tetrads furnished proof of breeding. Nests are difficult to find, built just off the ground in a patch of rough grass or nettles, but they are often surprisingly open when they are located. Grasshopper Warblers seldom use their alarm call – a harsh ‘tack’ – and often do not perch on their way to and from the nest, the adults carrying small grubs and caterpillars flying fast and low, and often only seen out of the corner of an eye, then creeping the last few metres through the undergrowth to reach the nest. They can, however, be quite obvious when carrying faecal sacs away from their nestlings. I had an unusual experience on 2 June and 3 June 2005 at Frodsham when a pair of Grasshopper Warblers was still carrying faecal sacs from chicks that had left the nest. Chicks often scatter from the nest before they can fly and spend several days crawling around in the undergrowth. 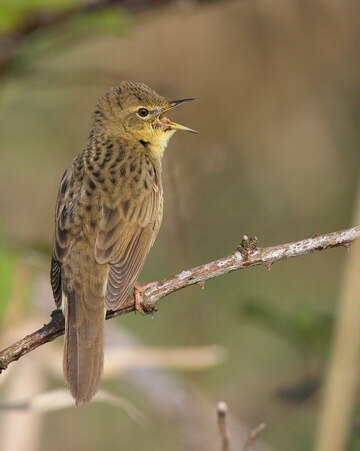 Grasshopper Warblers in the county start breeding in late April, often having two broods, so evidence of breeding presence can be obtained throughout their extended season, sometimes into early August. Most of the Atlas records (58 tetrads) were of song. Some of these could have been from birds on passage, and the map might overstate the species’ status; but on the other hand, their most sustained singing is usually around dawn and dusk, and sometimes during the night, so some birds might have been missed unless observers were in the right part of the tetrad early in the morning. Although they are often thought of as a bird of damp areas, Grasshopper Warblers will occupy a wide range of habitats, from the lowest to the highest altitudes of the county. The 100 habitat records submitted in this survey comprised as many as 26 different codes. 42 of the records were in the category C (semi-natural grassland and marsh), and the top five codes were C7 – Reed swamp; C5 – ‘Other’ dry grassland; B1 – Regenerating natural or semi-natural woodland; E2 – Unimproved grassland; C6 – Water-meadow/grazing marsh. This species is not well-covered by any of the standard BTO surveys, but several pieces of evidence point to a substantial drop in population since the 1960s (Riddiford 1983) and Grasshopper Warbler is now on the Red List of species of conservation concern. They winter in west Africa just south of the Sahara, and have also probably suffered from the Sahelian droughts. Habitat changes in Britain – drainage of swampy areas; maturation of scrub; ‘tidier’ agriculture – will all have reduced their available breeding sites. However, the species has high reproductive potential, as shown by analysis of nest record data (Glue 1990), so, where the habitat is right, they can flourish. Grasshopper Warblers can occur at high densities in areas of suitable habitat, as shown by the regular presence during this survey period of 3 or 4 pairs in 2.5 ha at Oxmoor Local Nature Reserve, Runcorn. In 1994 Mike Smith found five pairs in an area of 6 km2 along the Wirral Way between Heswall and Caldy; two of the pairs had second broods, and young fledged from all seven nests. Their variability, or the variability in their detection, is evinced by the Woolston warbler census figures of 1, 7 and 10 singing males in the three years of this Atlas. Assuming just one pair for each tetrad with possible breeding, and two or three pairs where breeding was probable or confirmed, the current population in Cheshire and Wirral is likely to be in the region of 110-140 pairs, about the same as the estimate twenty years ago. This is around 1% of the English figure, as expected if the county holds its proportionate share of the species’ total.